Descubra canales alejados de la ruta turística, así como atracciones como el Arsenale y el Puente de Rialto. El crucero en grupos pequeños con un máximo de 9 personas garantiza una experiencia personalizada. Vea el lado más tranquilo de Venecia con este crucero por el pequeño grupo. Diríjase al punto de partida cerca de la Plaza de San Marcos para reunirse con su guía y abordar una cómoda lancha motora. Disfrute del encanto tranquilo de las callejuelas venecianas y observe las escenas de la vida cotidiana junto al canal. Pasa por las puertas de Porta dell’Acqua para entrar en el astillero del siglo XII de Venecia, conocido como el Arsenale. Conozca cómo este histórico depósito naval estuvo alguna vez entre los más grandes de Europa durante el reinado de Venecia como una superpotencia marítima. A continuación, deslícese por los estrechos y pintorescos canales del barrio de Cannaregio y diríjase al Gueto judío de Venecia. Desembarque aquí durante 15-20 minutos para explorar los barrios históricos a pie y capturar fotografías de los edificios centenarios que rodean la plaza principal. Continúe en bote a los barrios de Santa Croce y Dorsoduro, y pase por un taller tradicional de góndolas en donde los artesanos esculpen y terminan a mano estas clásicas naves venecianas. Finalmente, salga a las aguas más anchas del Gran Canal para un crucero por las opulentas plazas e iglesias que bordean sus orillas. Flote debajo del famoso Puente de Rialto antes de regresar al punto de partida original cerca de la Plaza de San Marcos. This was a wonderful tour. Christiana was very knowledgeable about the history of Venice and the neighborhoods along the canal. We were able to see sites that you can't see on gondola rides. 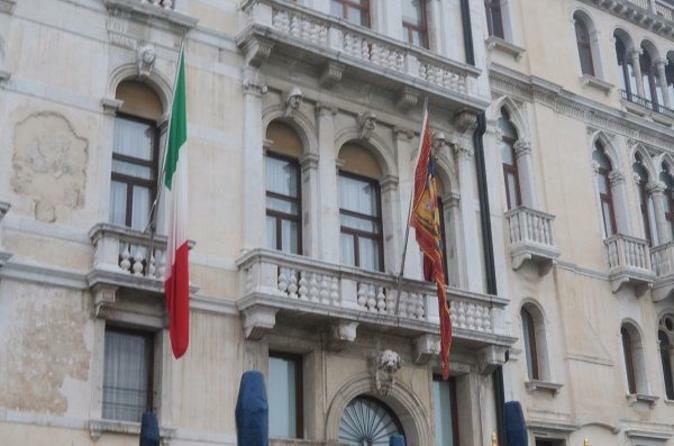 I also particularly enjoyed walking through the Jewish Ghetto and viewing the monuments. Christiana was very personable and professional. Excellent tour - extremely interesting - loved seeing the different types of boats used. The tour guide was very knowledgeable on the history and even many fun facts. 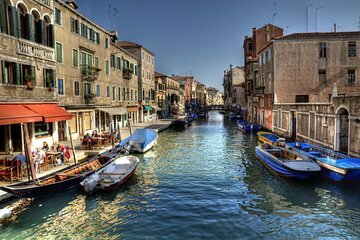 With this tour, you really feel like you have been able to experience Venice in a unique way. Definitely recommend this tour. Our tour was changed to one hour, but we were notified well in advance. Our guide, Christina, was excellent, even in very cold conditions. Highly recommend. The cruise was great. I really liked that it was a small group. Our guide was wonderful. She brought the history and magic of Venice to life. My husband and I loved this small group tour. Our tour guide was great and very knowledgeable! Would definitely recommend this tour! This was a fabulous way to see Venice by boat. It was the size of and same type of boat as the water taxis. The guide was very informative. It was a small group. He covered most of the Grand Canal, got off briefly in the Jewish Getto, and saw some of the less touristy back canals. Really an awesome tour, well worth it! Was looking forward to this tour and was very disappointed after finishing it. First of all the motor boat was too crowded - 8 passengers plus the guide. They put 4 of us in the back and 4 plus the guide in the front of the boat. It was a beautiful day and all the passengers in the back stood to enjoy the views. If you decided to sit outside you couldn't see anything around the people that were standing so you also had to stand. because 4 people were way too many and you couldn't move or even turn around to take pictures without pressing next to the people around you. The tour down the canal from the starting point was a waste of my precious time I had to enjoy Venice - not much to see other than St. Marks Square. Once the boat turned into the small canals the trip was very nice although as I said before, way too crowded. The stop at the Jewish Quarter was interesting but a little too long. Eventually the boat went into the Grand Canal but not far enough up the canal to enjoy all the Palaces, which is why you do the Canal. Personally I feel less time heading toward the Docks, and more time through the less traveled canals arriving at the Grand Canal farther up so tourists could see the best area of the canal. Of course there was plenty of room to sit inside the motor boat - naturally everyone wanted an outside view - especially to take pictures!! - Did not enjoy the trip due to the crowded boat.